Facilitate the more effective economic integration of the new ASEAN Member States and bridge the development gap among the Parties. Establishment of appropriate mechanisms for the purposes of effective implementation of this Agreement. With a view to expediting the expansion of trade in goods, the Parties agree to enter into negotiations in which duties and other restrictive regulations of commerce (except, where necessary, those permitted under Article XXIV (8)(b) of the WTO General Agreement on Tariffs and Trade (GATT)) shall be eliminated on substantially all trade in goods between the Parties. “non-tariff measures” shall include non-tariff barriers. The tariff reduction or elimination programme of the Parties shall require tariffs on listed products to be gradually reduced and, where applicable, eliminated in accordance with this Article. 1 January 2006 to 31 December 2011 for India and 1 January 2006 to 31 December 2016 for the New ASEAN Member States. In respect of those tariffs which have been reduced but have not been eliminated, they shall be progressively eliminated within timeframes to be mutually agreed between the Parties. The number of products listed in the Sensitive Track shall be subject to a maximum ceiling to be mutually agreed among the Parties. Products listed in the Sensitive Track by a Party on its own accord shall, where applicable, have their respective applied MFN tariff rates progressively reduced/eliminated within timeframes to be mutually agreed between the Parties. The commitments undertaken by the Parties under this Article and Article 7 of this Agreement shall fulfil the WTO requirements to eliminate tariffs on substantially all the trade between the Parties. The specified tariff rates/tariff preferences to be mutually agreed between the Parties pursuant to this Article shall set out only the limits of the applicable tariff rates/preferences or range for the specified year of implementation by the Parties. facilitation and promotion of effective and adequate protection of trade-related aspects of intellectual property rights based on existing WTO, World Intellectual Property Organisation (WIPO) and other relevant agreements. enhanced cooperation in services between the Parties in order to improve efficiency and competitiveness, as well as to diversify the supply and distribution of services of the respective service suppliers of the Parties. provide for the protection of investments. business visa and travel facilitation. others: handicrafts, small and medium enterprises, competition policy, Mekong Basin Development, intellectual property rights, government procurement. The Parties agree to implement capacity building programmes and technical assistance, particularly for the New ASEAN Member States, in order to adjust their economic structure and expand their trade and investment with India. Parties may establish other bodies as may be necessary to coordinate and implement any economic cooperation activities undertaken pursuant to this Agreement. With a view to accelerating the implementation of this Agreement, the Parties agree to implement an EHP, which is an integral part of the ASEAN-India RTIA, for products covered under paragraph 3(a) below. The progressive tariff reduction under the EHP shall commence from 1 November 2004, and tariff elimination shall be completed by 31 October 2007 for ASEAN-6 and India, and 31 October 2010 for the New ASEAN Member States. “applied MFN tariff rates” shall refer to the respective applied rates of the Parties as of 1 July 2004. Common products on which the Parties agree to exchange tariff concessions are listed in Annex A. Products on which India accords concessions to the New ASEAN Member States are listed in Annex B. The modality for tariff reduction and elimination for the products covered by the EHP shall be finalised under Article 8(2) of this Agreement. In order to fully realise the potential benefits of the EHP, the parties shall promote and facilitate trade in all products listed in the EHP. The parties shall also endeavour to refrain from using non-tariff measures adversely affecting trade in Early Harvest products. Products covered by the EHP shall qualify for tariff preferences in accordance with the Rules of Origin to be agreed under Article 8(2) of this Agreement. The WTO provisions governing modification of commitments, safeguard actions, emergency measures and other trade remedies, including anti-dumping and subsidies and countervailing measures, shall, in the interim, be applicable to the products covered under the EHP and shall be superseded and replaced by the relevant disciplines negotiated and agreed to by the Parties under Article 3(8) of this Agreement once these disciplines are implemented. The Parties shall also explore the feasibility of cooperation in the areas listed in Annex C.
For trade in goods, negotiations on the agreement for tariff reduction/elimination and other matters as set out in Article 3 of this Agreement shall commence in January 2004 and be concluded by 30 June 2005 in order to establish the ASEAN-India FTA. The negotiations on Rules of Origin for trade in goods under Articles 3 and 7 and modality for tariff reduction and elimination under Article 7 shall be concluded no later than 31 July 2004. For trade in services and investments, the negotiations on the respective agreements shall commence in 2005 and be concluded by 2007. The identification, liberalisation, etc., of the sectors of services and investment shall be finalised for implementation subsequently in accordance with the timeframes to be mutually agreed: (a) taking into account the sensitive sectors of the Parties; and (b) with special and differential treatment and flexibility for the New ASEAN Member States. For other areas of economic cooperation, the Parties shall continue to build upon existing or agreed programmes set out in Article 6 of this Agreement, develop new economic cooperation programmes and conclude agreements on the various areas of economic cooperation. The Parties shall do so expeditiously for early implementation in a manner and at a pace acceptable to all the Parties concerned. The agreements shall include timeframes for the implementation of the commitments therein. India shall continue to accord Most-Favoured Nation (MFN) Treatment consistent with WTO rules and disciplines to all the non-WTO ASEAN Member States upon the date of signature of this Agreement. Subject to the requirement that such measures are not applied in a manner which would constitute a means of arbitrary or unjustifiable discrimination between or among the Parties where the same conditions prevail, or a disguised restriction on trade within the ASEAN-India FTA, nothing in this Agreement shall prevent any Party from taking action and adopting measures for the protection of its national security or the protection of articles of artistic, historic and archaeological value, or such other measures which it deems necessary for the protection of public morals, or for the protection of human, animal or plant life, health and conservation of exhaustible natural resources. The Parties shall, within one (1) year after the date of entry into force of this Agreement, establish appropriate formal dispute settlement procedures and mechanism for the purposes of this Agreement. Pending the establishment of the formal dispute settlement procedures and mechanism under paragraph 1 above, any disputes concerning the interpretation, implementation or application of this Agreement shall be settled amicably by mutual consultations. There shall be established an ASEAN-India Trade Negotiating Committee (TNC) to carry out the programme of negotiations set out in this Agreement. The ASEAN-India TNC may invite experts or establish any Working Group as may be necessary to assist in the negotiations of all sectors in the ASEAN-India RTIA. The ASEAN-India TNC shall regularly report to the Minister of Commerce and Industry of India and the ASEAN Economic Ministers (AEM-India Consultations), through the meetings of the ASEAN Senior Economic Officials and India (SEOM-India Consultations), on the progress and outcome of its negotiations. The Ministry of Commerce and Industry, Government of India, and the ASEAN Secretariat shall jointly provide the necessary secretariat support to the ASEAN-India Trade Negotiating Committee (TNC) whenever and wherever negotiations are held. This Agreement shall include the Annexes and the contents therein, and all future legal instruments agreed pursuant to this Agreement. The Parties shall endeavour to refrain from increasing restrictions or limitations that would affect the application of this Agreement. Any ASEAN Member State may defer its participation in the implementation of this Agreement provided that a notification is given to the other parties within twelve (12) months from the date of signing of this Agreement. Any extension of the negotiated concessions to such ASEAN Member State shall be voluntary on the part of the parties participating in such implementation. The ASEAN Member State concerned shall participate in the implementation of this Agreement at a later date on the same terms and conditions, including any further commitments that may have been undertaken by the other parties by the time of such participation. The provisions of this Agreement may be modified through amendments mutually agreed upon in writing by the Parties. For the ASEAN Member States, this Agreement shall be deposited with the Secretary-General of ASEAN, who shall promptly furnish a certified copy thereof to each ASEAN Member State and India. 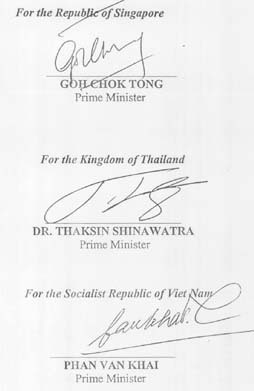 This Agreement shall enter into force on 1 July 2004. The Parties undertake to complete their internal procedures for the entry into force of this Agreement prior to 1 July 2004. Where a Party is unable to complete its internal procedures for the entry into force of this Agreement by 1 July 2004, the Agreement shall come into force for that Party upon the date of notification of the completion of its internal procedures. The Party concerned, however, shall be bound by the same terms and conditions, including any further commitments that may have been undertaken by the other Parties under this Agreement by the time of such notification. 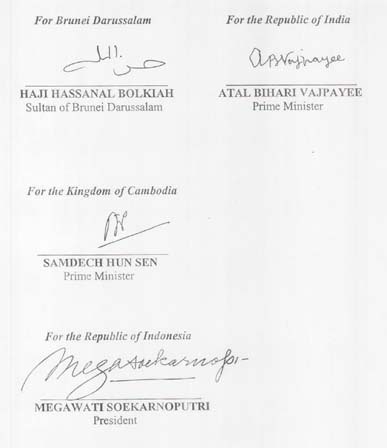 IN WITNESS WHEREOF, we have signed this Framework Agreement on Comprehensive Economic Cooperation between the Association of Southeast Asian Nations and the Republic of India. DONE at Bali, this 8th day of October, 2003 in duplicate copies in the English Language.